Alton Towers is the UK’s number one Theme Park. Besides being home to some of the most adventurous roller coaster rides in Europe, it’s also a beautiful destination for the whole family – all set on the backdrop of the towers which date back to the 8th century. Amongst the thrill rides is a more private area for children called CBeebies Land. 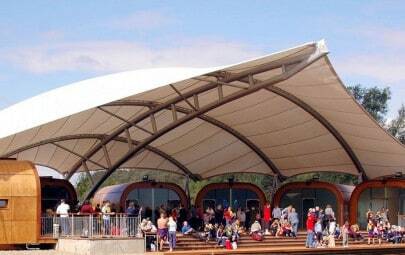 As part of a dramatic transformation to this part of the park, Architen Landrell designed, engineered, manufactured and installed a bright new tensile fabric structure for the ‘Big Fun Showtime’. 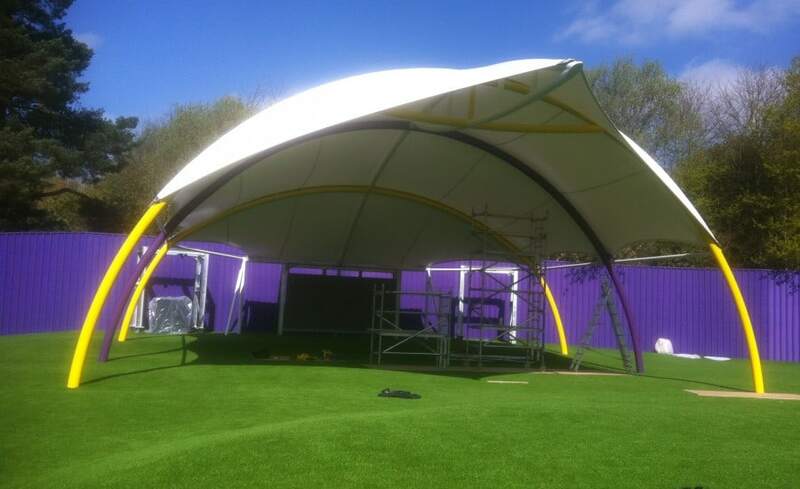 Taking Centre Stage is a new permanant outdoor performance space covered by an 18m x 12m barrel vault fabric structure. 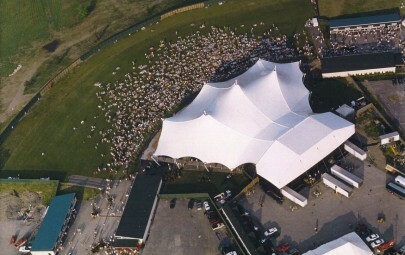 The canopy was designed to teardrop down behind a large acoustic wall. This wall and along with the fabric canopy roof will help keep the sounds from under the canopy within the boundaries of CBeebies Land. At the base of the teardrop is a series of video screens for entertainment. Cancer Research UK says skin cancer in children is on the rise. Protecting children from sun is important and one way to address this is by having 250m2 of covered outdoor space for them to play under. 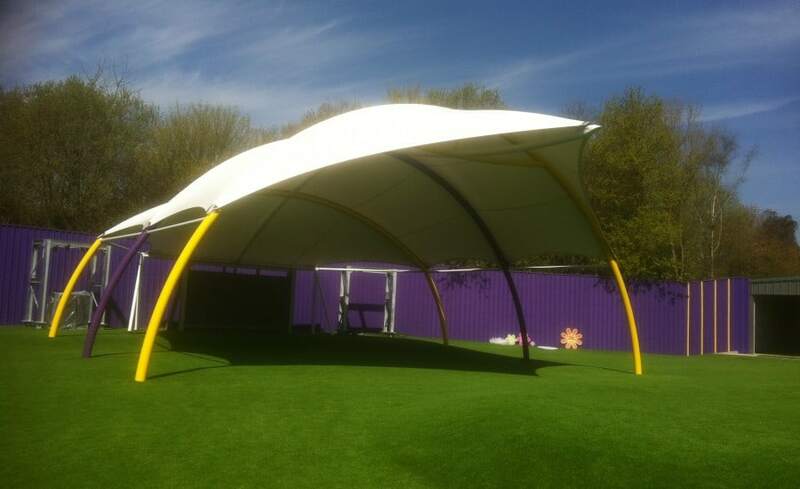 The canopy not only helps keep them cool on hot days, but dry on the wetter ones. 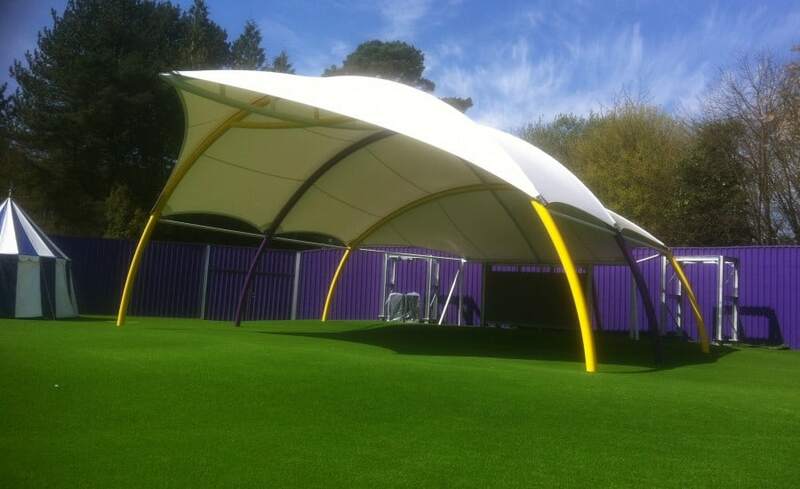 The white PVC coated polyester fabric is supported by a colourful framework. 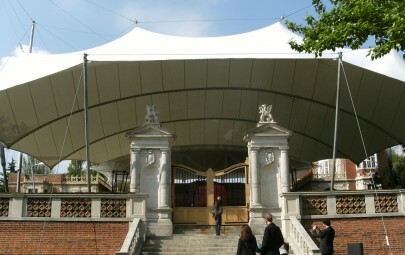 Three different colours were used to allow the canopy to fit into the new ‘playful’ setting. When the sunlight goes down, the canopy becomes ‘alive with light’. Fitted with steel lighting rigs for performances, the bright white fabric will become a canvas for CBeebies Land to display images, graphics and patterns. 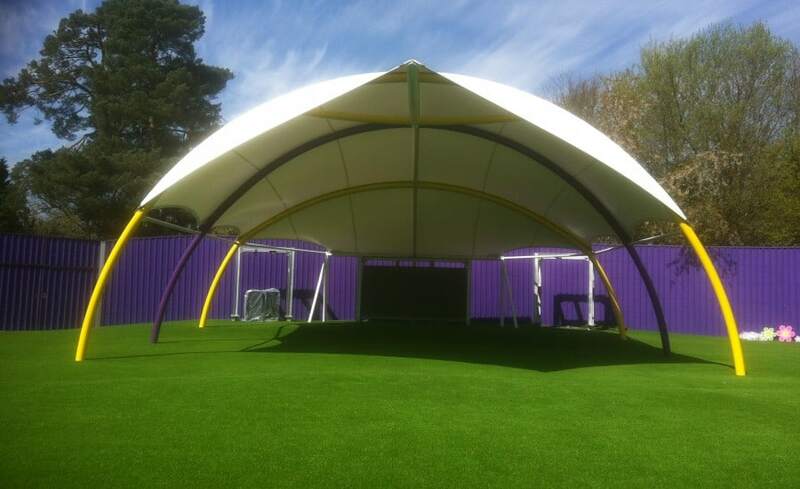 The canopy features fabric with Nano Technology. This is our second project in the UK to have Nano fabrics incorporated into the design and we’re looking forward to tracking its performance. Nano technology works like the leaves of a lotus plant. When water hits it, rather than wetting the surface, it beads up and rolls off the canopy, taking dirt particles with it and self-cleaning. Every rain shower allows this structure to self-clean – reducing the need for maintenance.